Little Sugar Creek Farm has produced five foals to date. We are excited to announce we have two foals coming Spring of 2018! Stay tuned for picture updates! Bella is registered KWPN (Royal Dutch Sporthorse). Everyone gets along with Bella, horse and human alike. She has passed on her amiable nature to her 2014 filly, Julep. Bella is also mother to our newest addition, Margaux born on May 1, 2018. A striking black filly! We are very excited to watch this young one grow and develop! Stay tuned for pictures! 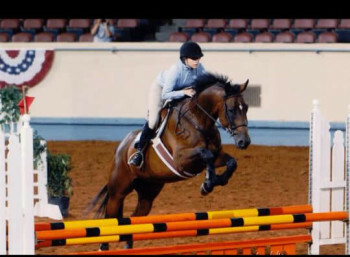 ​Cairo is an Oldenburg and was a successful jumper. We are pleased to announce Cairo had a beautiful colt, Luxor born on March 14, 2018! Pictures are soon to come! Devan is registered as an Oldenburg and has had two foals here, Shock Top (2012) and Farrah (2013). Although they are half siblings, Devan passed on her refined, feminine head to both! Devan was relocated in Jan 2017 to a new home in Texas, and has recently foaled out a beautiful bay filly! GiGi is an Oldenburg and mother to Hercules (2011) and Athena (2014) who are full siblings. GiGi was retired as a broodmare, and is currently living lavishly on 200 acres!